The Lenovo ThinkPad 50s is a durable machine, but doesn’t provide the power needed for a real workstation-class notebook. 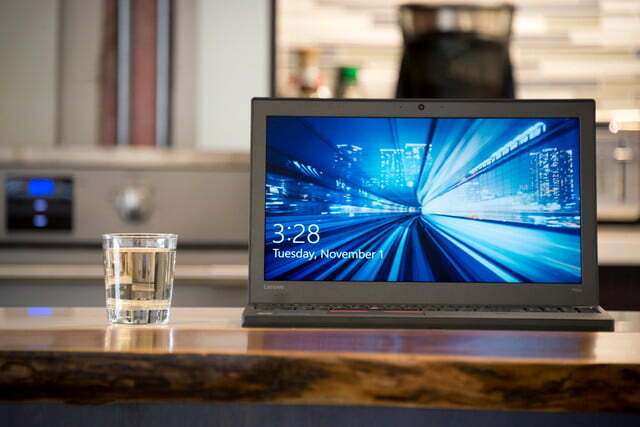 If you’ve primarily used a modern notebook or 2-in-1, such as Microsoft’s Surface Pro 4 or MacBook Air, then you might find the size of Lenovo’s ThinkPad P50s something of a shock. Certainly, that was our first impression as we put our hands on the machine to begin this review. 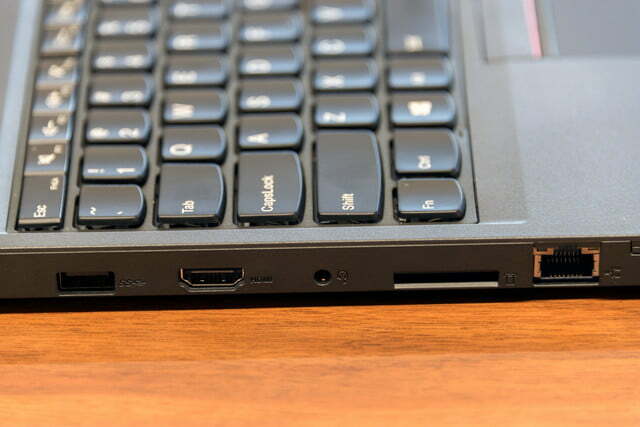 The ThinkPad P50s, though supposedly the slim model in its line-up, is chunky for 2016. The more you use the P50s, however, the more it should start to feel a little more reasonable. It’s a big machine, yes, but its 15-inch screen – again, many people use screens 13 inches or smaller – might seem luxurious. In fact, when considering the notebook’s audience, it all begins to make more sense. The ThinkPad P50s is simply not the kind of machine a traveling professional uses on a plane, or at Starbucks. Instead, it’s designed to be a workhorse that can travel, if that’s needed. 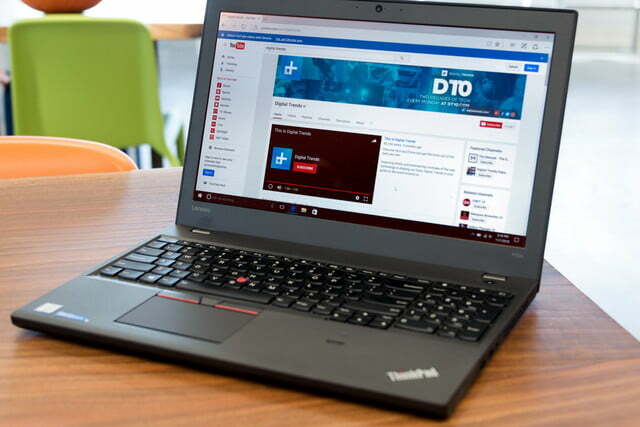 The ThinkPad P50s should be evaluated on its own merits as a Windows 10 “portable workstation” class machine that wasn’t intended to fill the same roles as a thin and light productivity machine. But as we’ll see in a bit, the dual-core Intel Core i7 processor and relatively underpowered Nvidia Quadro M500M GPU complicate matters from that perspective. And the as-reviewed retail price of $1,980 should raise some eyebrows, as well. 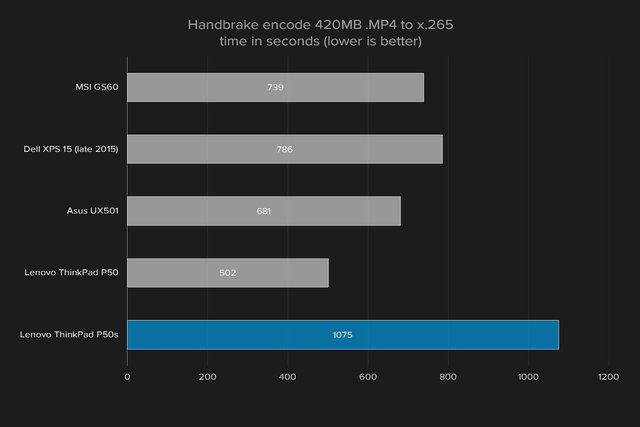 The ThinkPad P50s isn’t such a large machine when compared with others in its class. This isn’t a business productivity notebook for editing Office documents. Instead, this is a machine that will be used to edit images in Adobe Photoshop and videos in Adobe Premiere, and to render 3D drawings in AutoCAD – although that last one might be a bit of a stretch, as we’ll see later. When you look at the ThinkPad P50s from that perspective, then suddenly it doesn’t seem so huge. In fact, if you go by the stickers on the palm rest and on the back of the machine, then you see that the P50s is in fact a bona fide Intel Ultrabook. That’s odd, given that most Ultrabooks are incredibly thin and light, but apparently, the specification can be stretched to include machines like the P50s. If you’re going to compare the P50s to any other machine, probably the best candidate is its more robust sibling, the ThinkPad P50. Where the P50s is 14.98 by 10.17 by 0.88 inches, the P50 is 14.86 by 9.93 by 1.16 inches. The P50s weighs 5.0 pounds, and the P50 weighs 5.7 pounds. 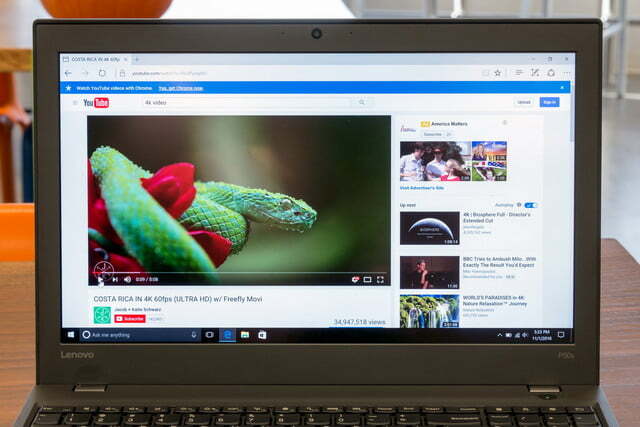 These dimensions are similar, with the exception that the P50s is roughly 25% thinner than the P50 — and in fact that’s the dimension that qualifies the P50s as an Ultrabook, which must be 23mm or thinner for machines larger than 14 inches in screen size. The P50s is a rugged machine. It’s made of durable matte plastic built to resist dents and scratches, and feels like it’s built to last. In fact, the P50s meets the MIL-STD-810G specifications for humidity, extreme temperatures, drops, and shocks. It also sports a splash-proof keyboard to protect against the occasional coffee spill. While the P50s is thin for a portable workstation, it’s thick enough that it supports a wide variety of ports. 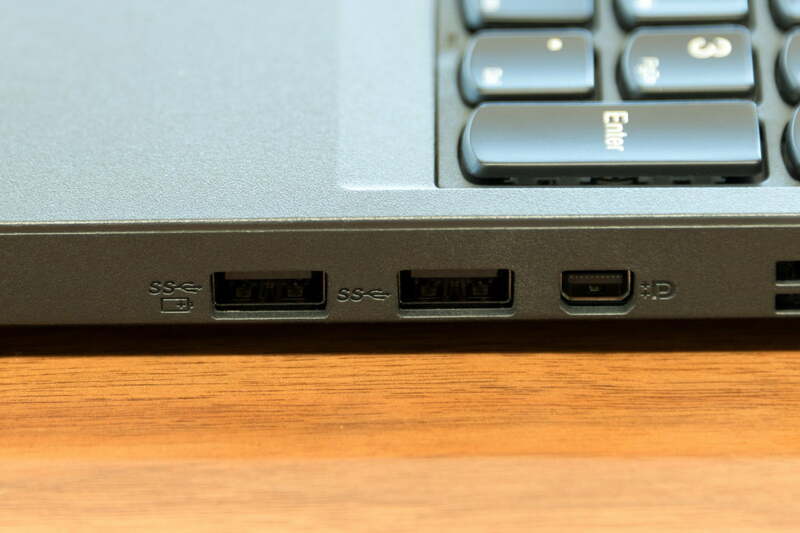 There are three USB 3.1 Type-A ports, one HDMI connection, and one mini-DisplayPort, providing more ways to connect than most modern laptops. It’s a big machine, yes, but a large screen has its benefits. All the USB ports are Gen. 1, however, meaning you won’t get the Thunderbolt 3 support that comes with the P50. 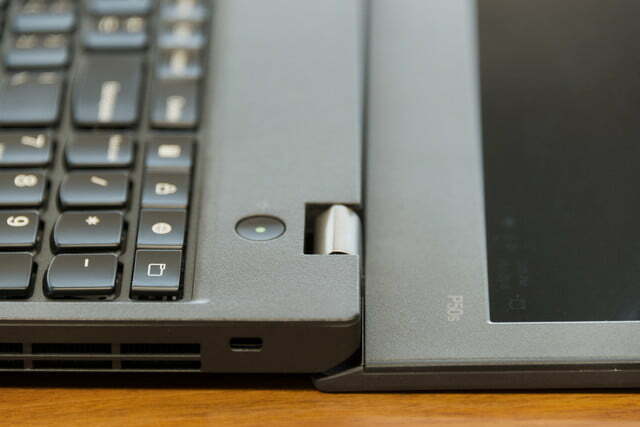 One USB port does support Lenovo’s Always On charging functionality, so you can charge a phone while the laptop is in sleep mode. In addition, the P50s offers a Lenovo docking station port, a 3.5mm audio jack, and a 4-in-1 card reader supporting MMC, SD, SDXC, and SDHC. A fingerprint reader with Trusted Platform Module support allows for secure login, and supports Windows Hello. The webcam is 720p, with 180-degree wide-angle viewing. Finally, the case is just thick enough to squeeze in a gigabit Ethernet port. Wireless connectivity is provided by 802.11ac Wi-Fi and Bluetooth 4.1. Is that a ThinkPad keyboard? 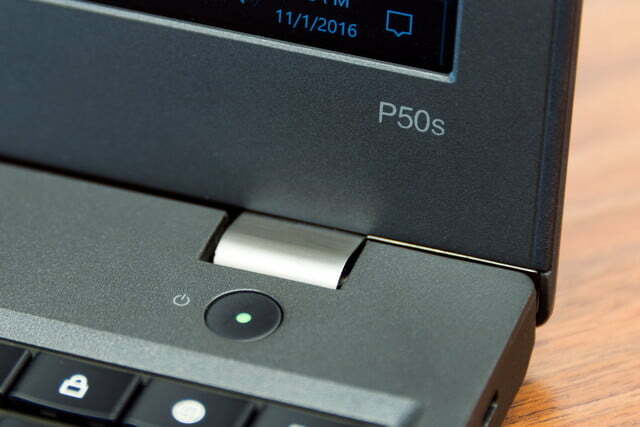 The P50s’ keyboard looks like the typical Lenovo ThinkPad variant, but as you start typing you’ll notice that it doesn’t feel up to Lenovo’s usual standard. The keys are well-spaced, as they should be given the notebook’s overall size, and there’s a numpad for anyone who needs to input copious amounts of numerical data. The keys have decent travel with little keyboard flex. However, the overall feel can be described as spongey. It’s as if Lenovo dialed down the usual ThinkPad springiness, resulting in keyboard that’s serviceable but not comfortable over long stretches. The keyboard is also uncomfortably placed for anyone who’s accustomed to the typical modern notebook. The standard alphanumeric keys are shifted well to the left to make room for the numeric keypad, so finding the home row without looking takes some practice. If you’re used to large notebooks, and you might be if you’re in the market for a near-workstation class machine, then and you’ll feel at home. If that’s not you, then you might find the keyboard’s overall feel to be less than comfortable. The touchpad was relatively small compared to the palm rests, and set way to the left. It doesn’t mimic the notebook’s screen dimensions, and it’s centered underneath the alphanumeric part of the keyboard. Again, you might get used to the touchpad after a time, but you might also be left feeling like you’re reaching for it. 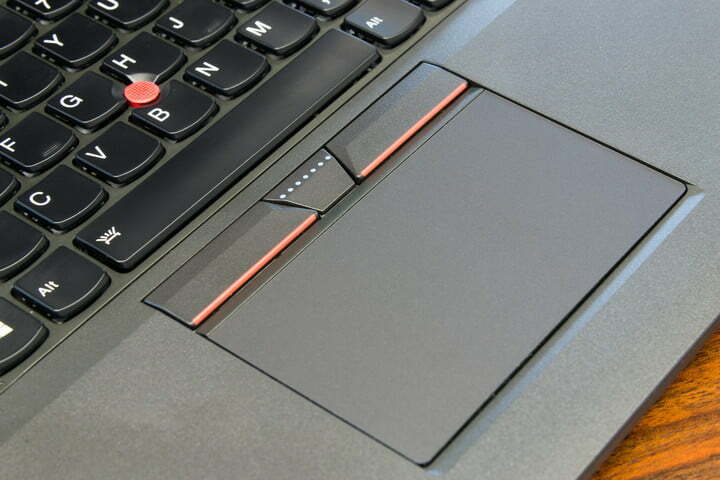 While Lenovo offers a utility that can customize the touchpad thirteen ways to Sunday, it’s not a Windows 10 Precision Touchpad, and so doesn’t support Microsoft’s convenient gestures. Nevertheless, the touchpad is generally responsive and consistent. It’s worth noting that the review unit seemed to have an issue with the lower-right touchpad button. It was often unresponsive and required a few clicks to engage. The lower-left button didn’t have this issue. Overall, the touchpad buttons were clicky, but not so loud that they were a disruption. Lenovo also equipped the ThinkPad P50s with it TrackPoint nubbin set in the center of the alphanumeric keyboard, so if that’s your preferred input method, you’re all set. 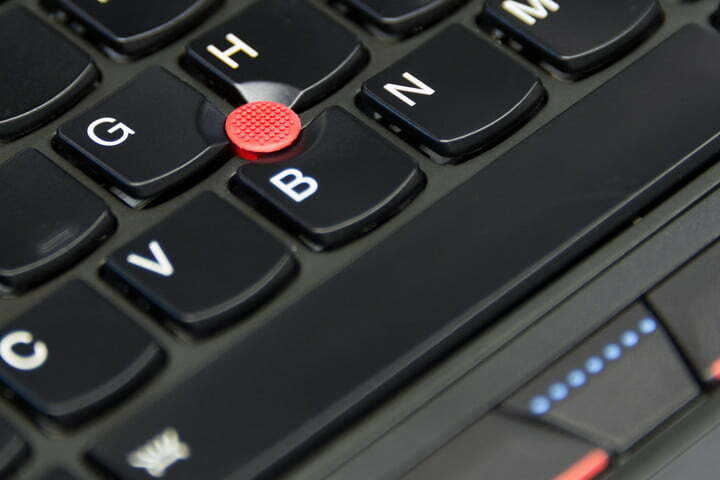 The TrackPoint is on par with the standard unit, with the same three buttons are set at the top of the touchpad. Compared to the touchpad buttons, these had a softer and quieter mechanism. Subjectively, the screen was another aspect of the machine that might feel wrong at first glance, no pun intended. The reason is simple. 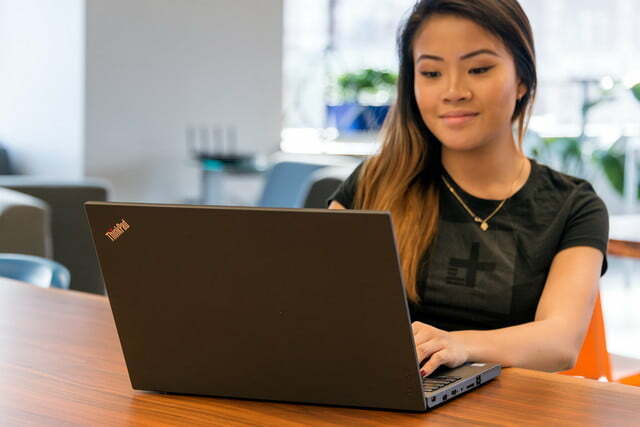 Unlike most modern notebooks you might have spent time with over the last few years, the ThinkPad P50s has a matte finish. Glossy screens are so prevalent that this one might look flat when its first fired up. However, on further use, we found the ThinkPad P50s has a bright screen with good colors and decent white balance. Its contrast seems solid, and while nothing pops as it would with a full glossy screen, there’s also far less glare from overhead lights. Just don’t touch. That’s not included. While the ThinkPad P50s can be configured with a 15.6-inch Full HD screen, our review unit was equipped with the high-end 15.5-inch “3K display” with 2,880 x 1,620 resolution. While Windows 10 apps look great, thanks to the display’s high pixel density of 214 pixels per inch, apps that aren’t optimized for high DPI have tiny user interface elements and text. Objective tests didn’t quite match subjective assessments. 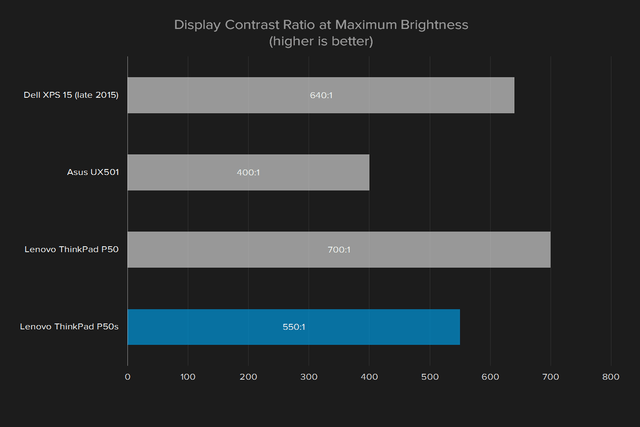 The ThinkPad P50s has an average contrast ratio of 550:1, which was beat out by the ThinkPad P50 at 700:1. 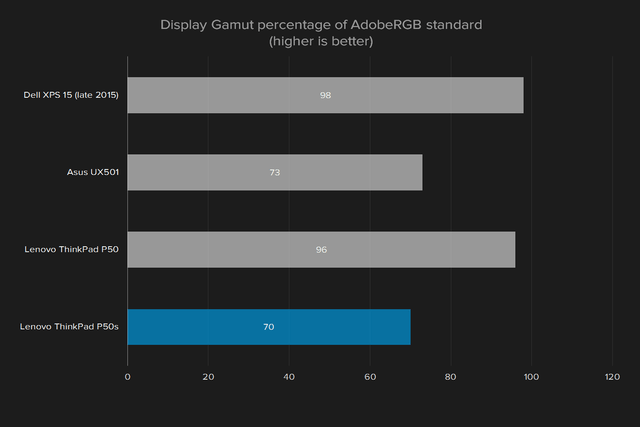 Color gamut was 70 percent of AdobeRGB, which is at the low-end for a machine that’s intended to serve as a graphics design workstation. 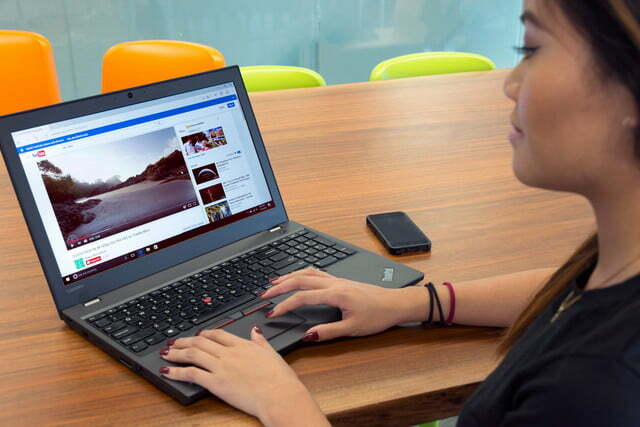 The ThinkPad P50 had a much higher score of 96 perfect of AdobeRBG, and the Dell XPS 15 was even higher at 98 percent. On the other hand, the screen hit perfect gamma at 2.2, which is a positive. Brightness was good at around 330 lux, making it a decently bright screen that should be usable in just about any conditions, given the matte finish. 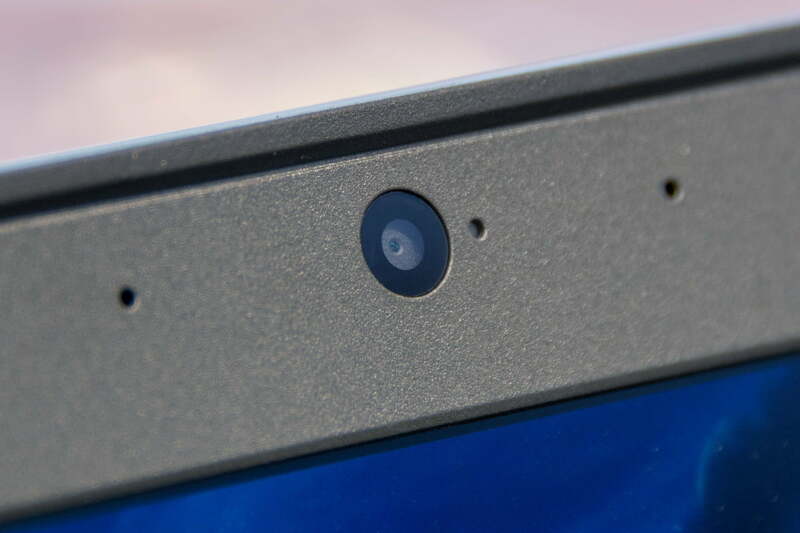 Overall, display quality is respectable, but not best-in-class. 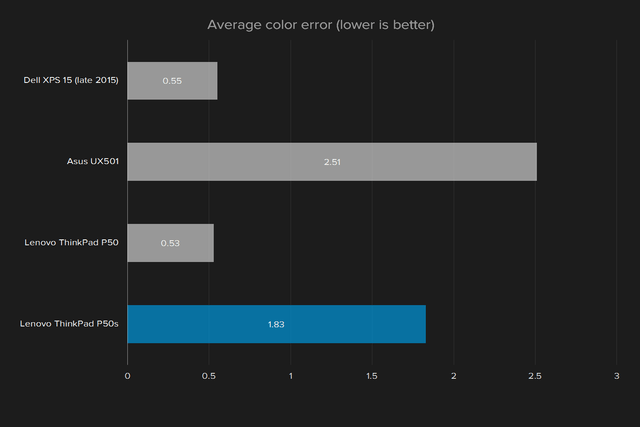 We thought that movies and photos looked good, but the color gamut may become an issue if you’re doing color critical work, particularly outside of the sRGB range. Given that the “3K display” is an upgrade, most users will probably be better served sticking to a standard 1080p panel. Where the P50s differs most from its workstation competition is in its processor. The typical modern workstation touts a quad-core processor for maximum performance, with less concern for things like battery life and keeping the machine cool enough to sit on a lap. The P50s, on the other hand, uses more pedestrian Intel Core processors. 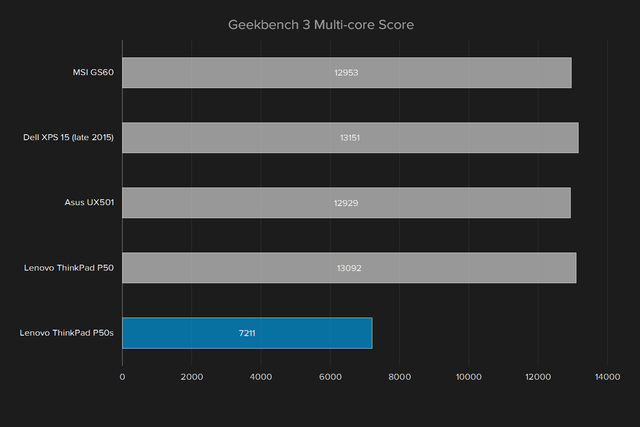 Options include the Core i5-6300U, Core i7-6500U, and Core i7-6600U, the latter of which was running in our review unit. The review unit was also equipped with 16GB of 1600MHz DDR3L DRAM, meaning that it’s going to meet the needs of all but the most power-hungry. The P50s can be upgraded to 32GB of RAM. 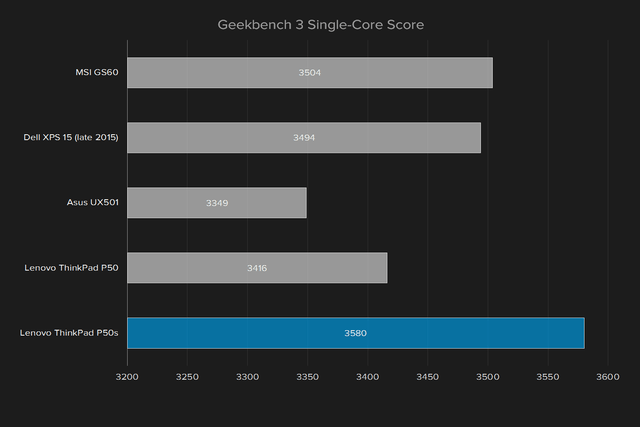 The Lenovo ThinkPad P50s had competitive performance per Geekbench’s single-core benchmark, but fell off in the multiple-core benchmark compared to other machines, including the Xeon-equipped ThinkPad P50. The machine was also way behind in our Handbrake test, where it took over twice as long as its sibling to encode our 420MB test file. Simply put, it’s hard qualify the ThinkPad P50s as a real workstation with this kind of CPU performance. You can easily get a smaller machine that would perform as well, or better. Again, the Dell XPS 15 is a great example, providing outstanding performance in a much more svelte frame. The ThinkPad P50s can be equipped with NVMe SSDs, but our review unit was equipped with a standard Samsung PM871 SATA with 512GB capacity. 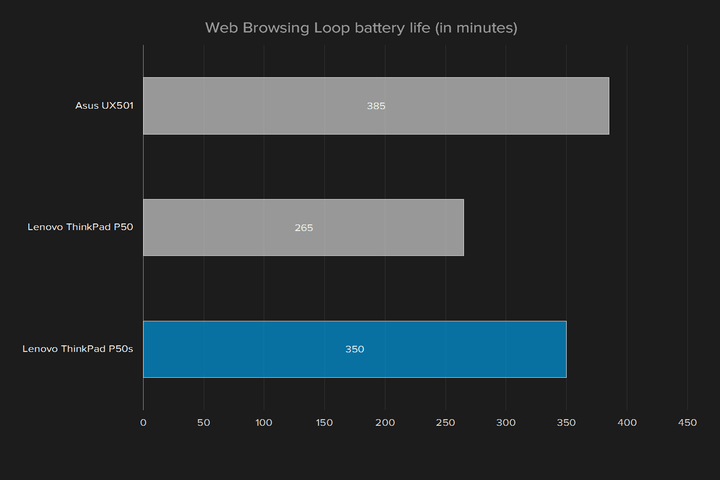 That limited performance in reading and writing data, at least when compared to the quickest laptops we’ve tested. 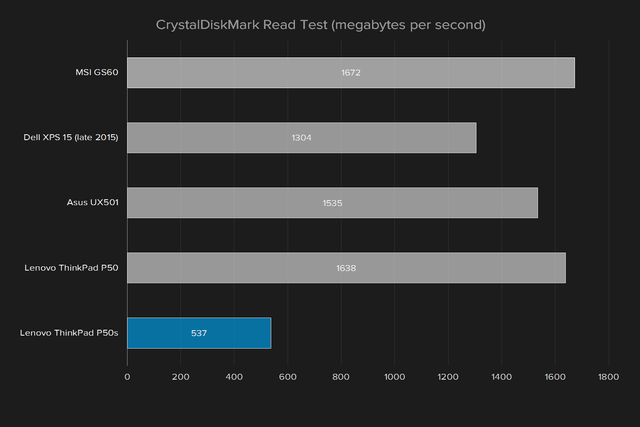 As you can see, read performance was roughly a third as much as the best competitive machines. Write performance was in line with similarly equipped notebooks, but well behind the PCIe drive in the ThinkPad P50. 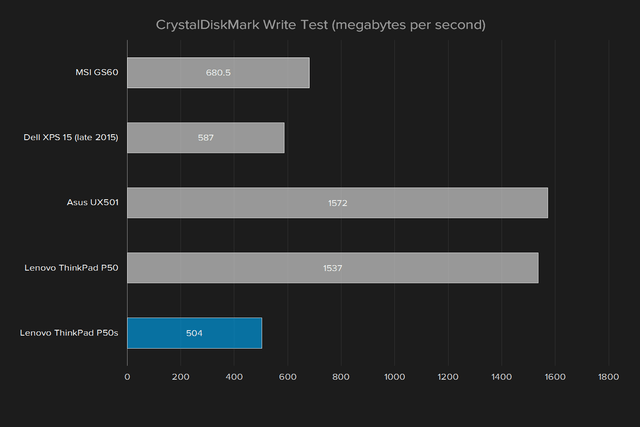 Again, it’s hard to qualify the ThinkPad P50s as a high-performance, workstation-class device with these results. 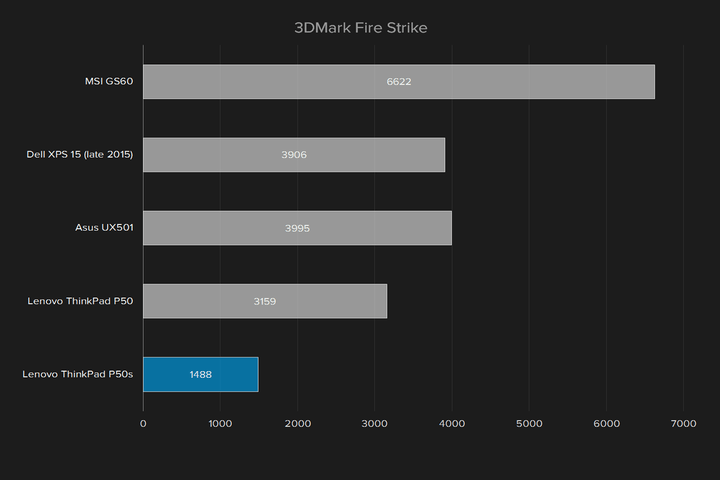 Another area where the ThinkPad P50s cuts some corners is the GPU, with an Nvidia M550M rather than the ThinkPad P50’s much more robust Nvidia M2000M. That means the P50s isn’t going to provide true workstation-class 3D rendering in AutoCAD or the utmost Photoshop processing speeds, nor is it going to serve as much of a gaming machine. The Quadro designation means the GPU provides certified drivers for AutoCAD and other professional applications, which is worth some additional performance and stability advantages even if the overall performance in standard benchmarks isn’t the greatest. We mentioned earlier that while the P50s has components that would be reasonable for the typical productivity Ultrabook, it’s at the low end for a workstation-class machine. It’s plenty snappy for typical productivity tasks, but it’s not going to serve terribly well as a full-time workstation or as a gaming notebook. It’s likely best for someone who needs to work on large Photoshop images or touch up 2D AutoCAD drawing while away from the office, but who has a primary machine where they do the bulk of their work. We used Civilization VI was used to determine how the ThinkPad P50s would run a modern game. The game defaulted to mostly “low” settings. That’s a good thing, because while the game was playable at those settings, it’s reasonable to assume that pushing the graphics much higher would have resulted in a less-than-pleasant experience when there’s a lot of activity going on at once. The machine also got rather hot, and the fans were running throughout. For a “portable workstation,” the ThinkPad P50s doesn’t have the best endurance we’ve ever tested. It’s equipped with an interesting dual-battery configuration, with a 44 watt-hour internal battery and a choice of three external batteries, 23 watt-hour, 48 watt-hour, and 72 watt-hour. The external battery plugs into the lower rear of the machine, and can be easily swapped for a quick jolt of battery life. The review unit was equipped with the 23 watt-hour external battery for a total of 67 watt-hours of battery. As you can see, the ThinkPad P50s lasted a little more than an hour longer running the than its more robust sibling. 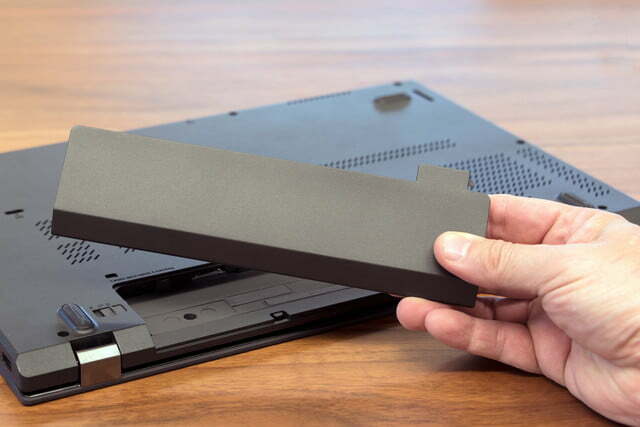 The primary benefit of the ThinkPad P50s, then, is that it allows for easy hot-swapping of a second battery, for an instant power boost of up to a massive 72 watt-hours, with some additional bulk. For the most part, the ThinkPad P50s was a quiet machine. Under significant loads, the fans became audible but were never so loud that they were disruptive. In fact, a Surface Pro 4 running right next to the ThinkPad was the louder machine. In terms of heat, the machine did get too warm to comfortably use on a lap. The keyboard was never warmer than around 86 degrees Fahrenheit on any part of it, but the bottom of the case reached a toasty 110 degrees. There’s a setting in the Lenovo Settings app dubbed Intelligent Cooling that is intended to keep the machine a little cooler when you’re using it on your lap, but will also impact performance. The P50s comes with a one-year depot or carry-in warranty, which is a tad disappointing for this class of business machine. In some cases, it’s possible to find laptops of this class that have a three-year warranty, though that’s not a rule. Longer warranties up to five years are available for purchase from Lenovo. The low-end P50s with Core i5-6300U, 4GB of RAM, and a 500GB mechanical hard drive retails for $1,100. As equipped, our review unit runs $1,980 on Lenovo’s store. That’s not a great price for a machine with those specs, but it’s not the worst price either. Note that you can find this laptop for less if you shop around, and perhaps if you can save a few bucks, then the value proposition could be improved enough to get another look. If you’re looking for a business-class machine that’s well-built and offers an Nvidia Quadro GPU with certified drivers for applications like AutoCAD, then the Lenovo ThinkPad P50s is a decent, but not great choice. You might want to open your wallet a little wider and step up to the Lenovo ThinkPad P50 if you’re pushing those professional-level applications, which will offer significantly enhanced performance for not too much more money or bulk. The ThinkPad P50s is built like a tank, and so if you’re looking at how long the machine will physically last, the answer is that it should last a long time, indeed. If you’re looking at its components, however, we can’t help but note that it’s using last-generation components for the CPU, GPU, and SSD, and it’s not terribly quick. Looking at it from the perspective of a mobile professional, then, the ThinkPad P50s is best considered a short-term buy. The Lenovo P50s presents a bit of a conundrum. It’s not thin and light, but it uses components that are similar in performance to the typical thin and light productivity notebook. You can find machines with Intel Core i7-6600U processors and arguably faster GPUs in a significantly smaller footprint. A classic example is the Dell XPS 15. That machine is not only smaller and lighter, but it performs significantly better across the board, especially when equipped with its discrete graphics option. 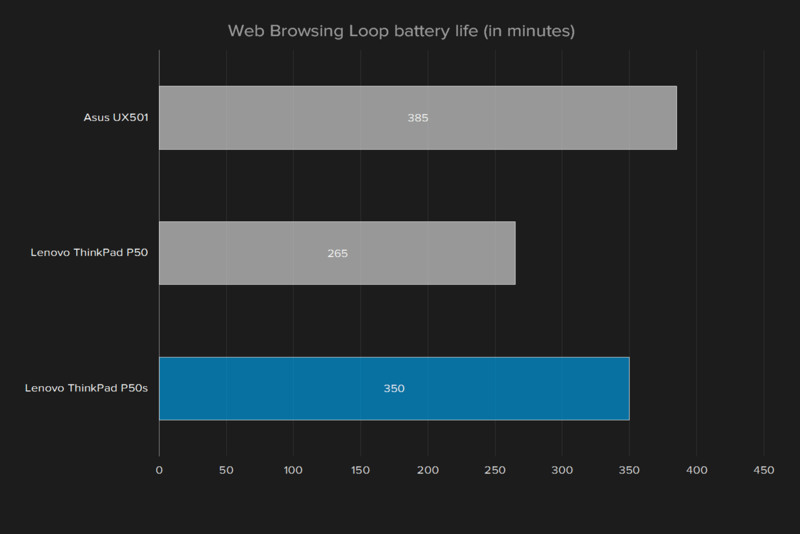 Battery life wasn’t great, but the ability to swap out the external battery provides some flexibility. The display is excellent, but again, it’s not terribly special for this class of machine. The Dell XPS 15 can be equipped with a screen that rivals the one on the P50s, and although the Dell’s is glossy, it also offers a touchscreen option. 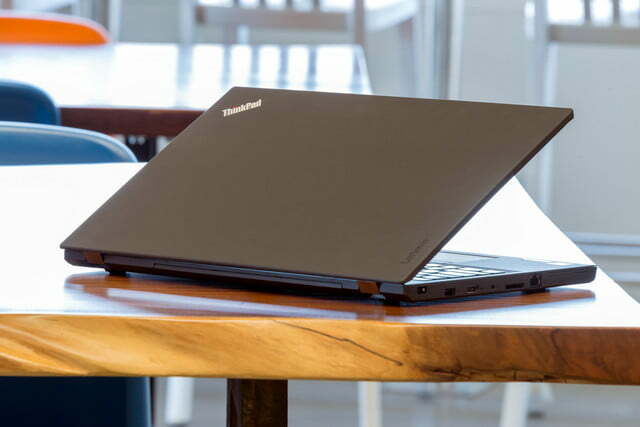 Our recommendation is that you give the ThinkPad P50s a pass. If you need a portable workstation with serious hardware, then give the ThinkPad P50 a look instead. And if you don’t need an ultra-durable chassis or certified graphics drivers, the Dell XPS 15 is a better choice.